Paramajit Kaur, head of ActionAid’s Aashray Adhikar Abhiyan, explains that the Homelessness campaign was set up in 2000 to work with homeless throughout India. At the end of 2006 in Delhi there were eighteen 24-hour shelters run throughout the year, 10 run by the Municipal Corporation of Delhi and eight run by ActionAid. Eight unused government buildings had been opened in 2006 in response to winter conditions. Despite the work already done, there were too few buildings and tent sites available. In many cases all ActionAid could do was offer tarpaulin sheets and blankets. 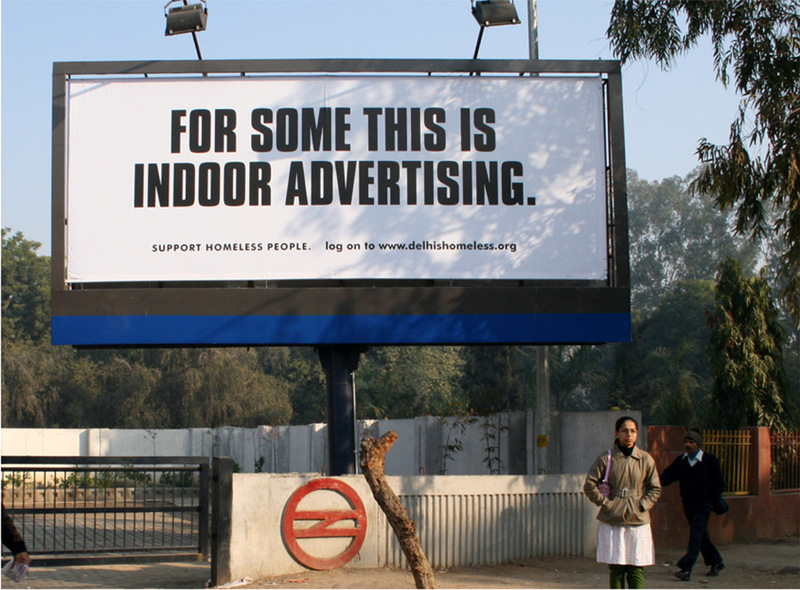 There were approximately 100,000 homeless people in Delhi, 5 percent of whom used night shelters in the winter. People can help Aashray Adhikar Abhiyan in many ways. There is a need for mattresses, blankets and warm clothes. Donations in money or kind are welcome. People can also offer their professional skills, whether they are teachers or medics teachers, IT professionals or craftspeople who can teach women new skills. The billboard was created at Grey Worldwide, New Delhi, India, by creative director Sandipan Bhattacharyya, creative director/art director Manoj Deb, and copywriter Aparaksha Mukherjee.